Bob Cury at RJC Yacht Sales announces a MAJOR $2M PRICE REDUCTION on the 2013 150′ (46 meter) Richmond Tri-Deck Motoryacht, STATUS QUO! Built by Canadian yard Richmond Yachts to ABS class, this Tri-Deck Motoryacht’s exterior styling is by Ward Setzer and was delivered in 2013. Accommodations for up to (12) guests in a six stateroom layout plus crew quarters for up to eight. The guest accommodation is configured as a full beam master suite, VIP stateroom, three doubles with queen sized beds and a twin cabin, all with full ensuite baths. A custom Pavlick Yacht Design interior features book-matched mahogany joinery with Saples and Pomele inlays throughout. Custom stonework in marble, granite, and onyx add to the flawless finish throughout the vessel. Status Quo is equipped with all of the large yacht options including Caterpillar 80KW generators, Quantum zero speed stabilizers and bow thruster, (2) Sea Recovery 1800 GPD watermakers, Atlas shorepower convertor, Alfa Laval centrifuge, flybridge Jacuzzi and a touch and go helipad. Currently available for inspection in Fort Lauderdale, Florida, with a new asking price of $22,995,000. Please contact the Central Agent Bob Cury for more information or go to our website http://www.rjcyachts.com/yacht.cfm?y=314 to view additional photography and virtual tour. 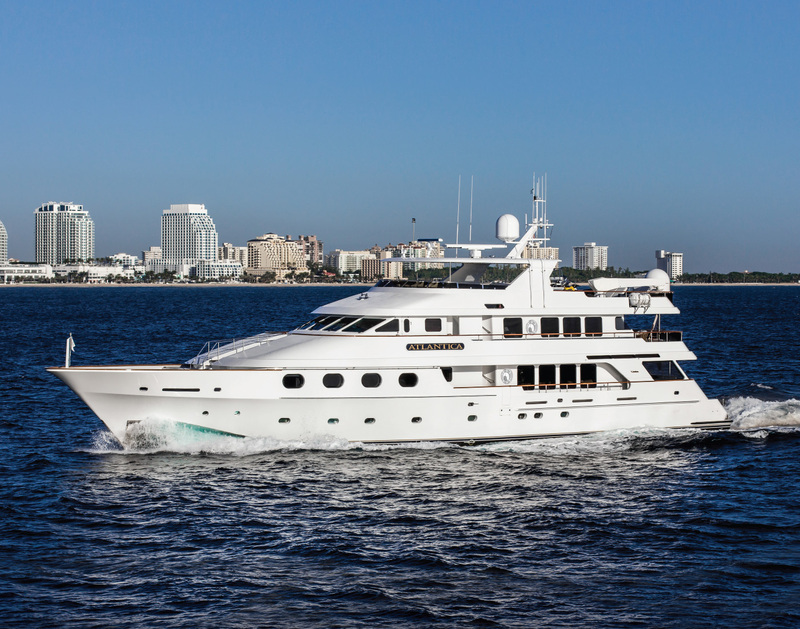 Motoryacht THEMIS has been sold with Bob Cury at RJC Yachts representing the seller and Chris Daves at Denison & Daves introducing the buyer. 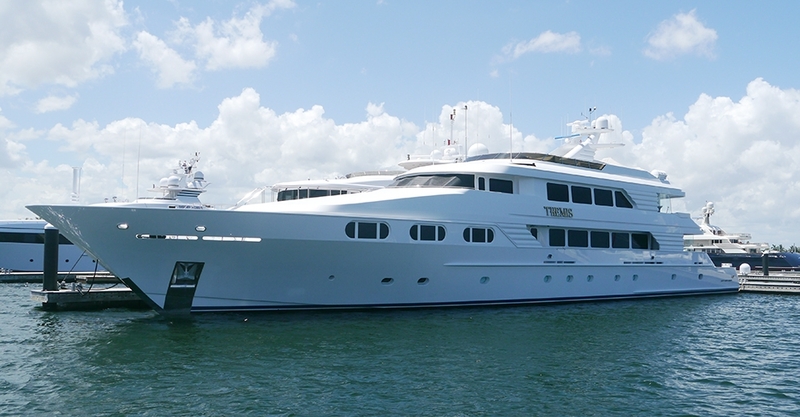 THEMIS was built in aluminum by US yard Trinity Yachts to an in-house design with delivery in 1998 and has been maintained to ABS class. A high-volume interior has been decorated by Dee Robinson and features mahogany and African pear wood joinery. The salon and dining area are comfortable and make for wonderful relaxation and dining areas. Accommodation is for 10 guests in five cabins. These include a master suite with a king sized bed, two VIP suites with king size beds, and two twin cabins all with full ensuite baths. Extensive deck areas have plenty of room for outdoor activities including a large flybridge with a bar, fridge, sink, ice maker and a six-person hot tub. Other features include full walk around decks, Naiad zero speed stabilizers and an Atlas shore power converter. Twin 2,250 Caterpillar engines give her a maximum speed of 21 knots and a cruising range of 6,000 nautical miles at 18 knots. THEMIS will retain her original name but will complete a refit over this summer to include a new interior decor, all new water toys, new electronics with V-Sat communications and the installation of zero speed stabilizers. 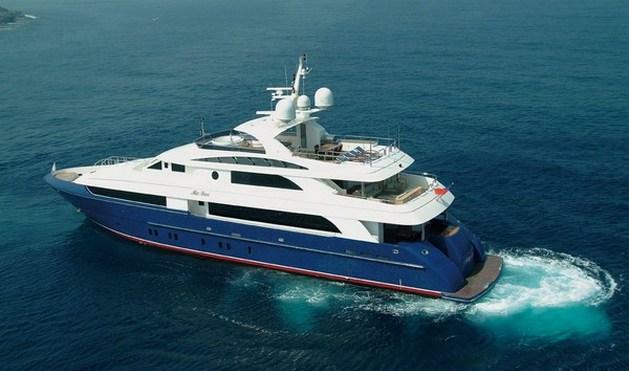 THEMIS will be offered for charter for her first time through RJC Yacht Sales. THEMIS was asking $9,995,000. The 2008 132′ Horizon Tri-Deck Motoryacht LADY LEILA is on her way back to South Florida from St. Maarten and was given a $500,000 price reduction. Additional photography and complete specifications can be viewed on our website: http://www.rjcyachts.com/yacht.cfm?y=321 or contact Central Agent Bob Cury 954-980-3451 / rjcyachts@aol.com for more information. T.G.I.F! Where will you be boating this weekend? 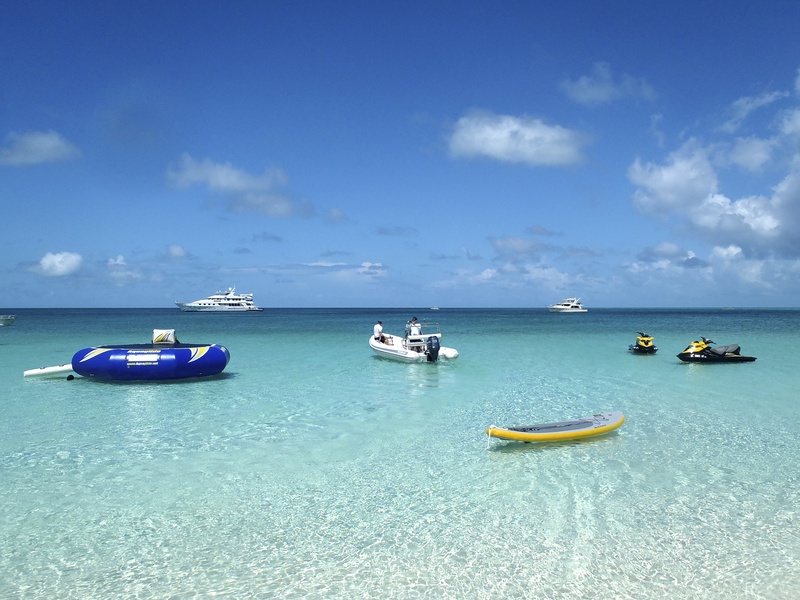 RJC Yacht Sales & Charter represents a beautiful fleet of charter yachts available to take you to any island paradise on your dream vacation! Contact Nicole Caulfield in our charter department today for more information or go to our website www.rjcyachts.com and check out great photography and virtual tours of all of our charter yachts. We have great opportunities to book a week stay or more this spring and summer from New England to the Caribbean. Call our office at (954)525-7484 to request an information package! RJC Yacht Sales & Charter Receive Two Major Price Reductions! RJC Yacht Sales & Charter received two major price reductions today! 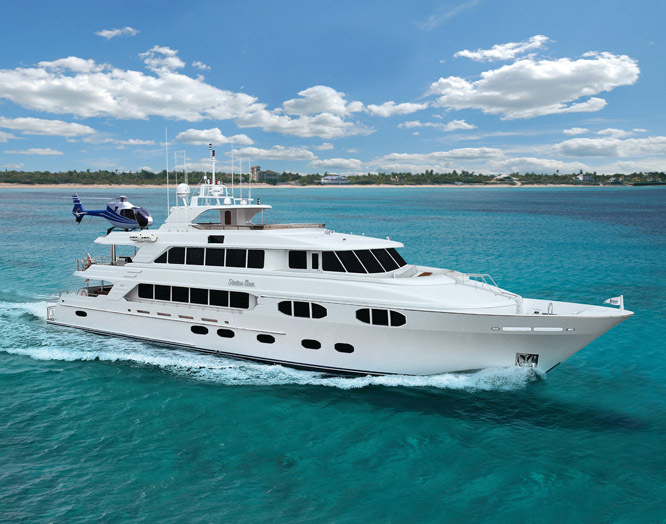 The 135′ Christensen Tri-Deck Motoryacht, ATLANTICA, just received a $1,500,000 price reduction and is now asking $8,495,000. ATLANTICA is available for inspection this weekend in Fort Lauderdale at Bahia Mar Marina and then will be moving into the Palm Beach Boat Show on Monday, Ramp D, Slip 115. 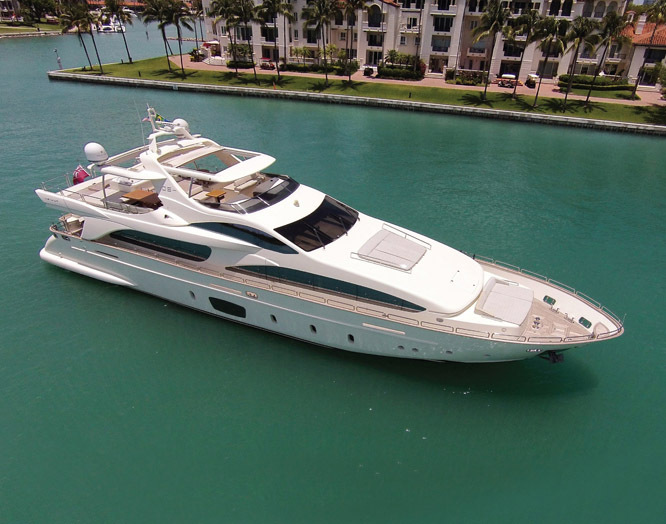 Also the 2010 105′ Azimut, LADY CAROLE, was given a reduction in price by $500,000 and is now asking $6,495,000. LADY CAROLE will also be available for inspection during next week’s Palm Beach Boat Show at the Palm Harbor Marina on C-Dock, Slip 203. Please contact the RJC Yachts Sales office at 954-525-7484 for additional information or to setup a private inspection on any one of these magnificent vessels! 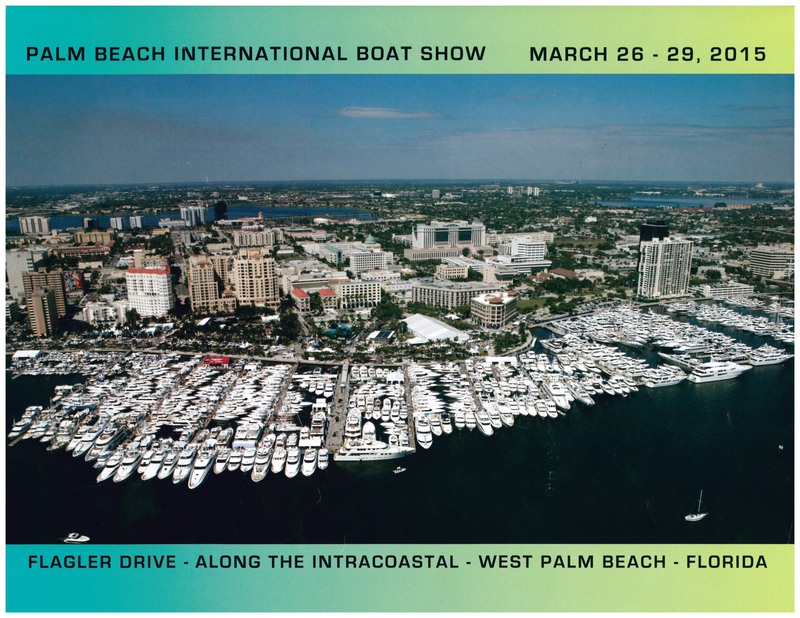 RJC Yacht Sales & Charter will be featuring two Tri-Deck Motoryachts at the Palm Beach Int’l Boat Show, March 26th thru 29th! RJC Yacht Sales & Charter is proud to be featuring two yachts on display during next week’s Palm Beach Boat Show, March 26th – 29th. RJC Yachts will feature the 156′ Trinity Tri-Deck Motoryacht, THEMIS, and the 135′ Christensen Tri-Deck Motoryacht, ATLANTICA at Palm Harbor Marina on Ramp D / Slips 115 & 116. Please contact our sales office for additional information and details (954)525-7484 or to schedule a private inspection. 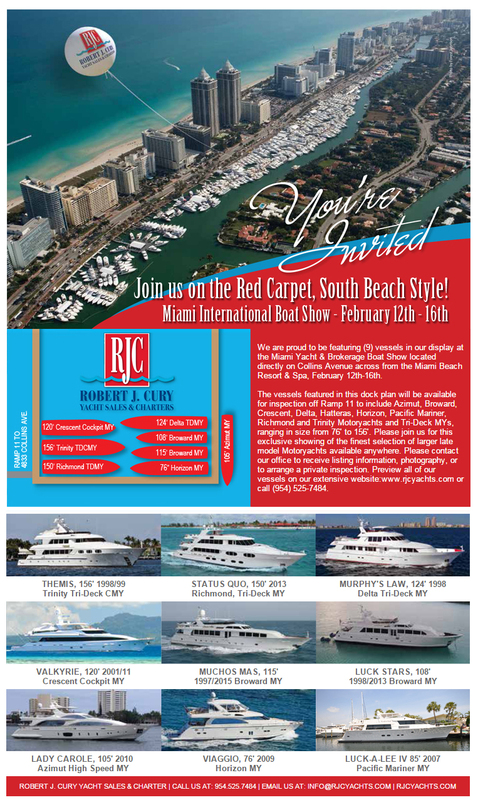 Join RJC Yacht Sales & Charter this week at the Miami Int’l Boat Show!